The books in my Five-Ingredient Mystery series have an appendix with recipes for some of the dishes mentioned in the story. This page contains a sample of those recipes. Visit my page on the HobbyReads blog for additional recipes. Read my reviews of cookbooks focused on recipes with few ingredients. Chocolate fondue makes an elegant dessert for a dinner party, a Valentine's Day treat, and an easy after-school snack for children. Cut up the fruit and cake before you start making this recipe. With a microwave, the fondue is ready within minutes. Mix the cream and the chopped chocolate in a microwave-safe bowl. Heat the cream and chocolate at half-power for 2 minutes, stopping the microwave every 30 seconds to stir the mixture. Whisk in the liqueur. Pour the chocolate into a small fondue pot on a stand over a lit candle to keep it warm or serve it in an ordinary bowl and reheat if necessary at half-power for 10-20 seconds in the microwave. Serve with your choice of fresh fruit, dried fruit, angel food or pound cake, ladyfingers, cream puffs, cookies, or marshmallows. ​Serves 6. Reheat leftover fondue in the microwave at half-power, stirring every 30 seconds. The French tarte Tatin is similar to an upside-down apple pie. This five-ingredient recipe uses puff pastry instead of a rolled-out crust. Note: To avoid excess juice in the pan when baking the tarte, cut the apples a day before to dry them out and put them in the refrigerator, lightly covered. They’ll turn brown, but they’ll do that anyway when they’re cooked. If you don’t have time for this step, put a pan or foil under the skillet when it goes into the oven to catch any drips. Slice the bottom off each apple to give it a flat base. Peel and quarter the apples lengthwise and remove the cores. Spread the butter on the bottom and sides of a seasoned 10-inch cast-iron pan and sprinkle the sugar evenly on the bottom. Arrange the apples vertically in the skillet, standing them on the flat end, in concentric circles. Pack the pieces close together so they support one another. Apples that stick up higher than the pan rim will shrink down as they’re cooked. Prepare the pastry while the apples are cooking. Follow the directions for defrosting the puff pastry. Then roll it out on a floured surface until it is 1/8-inch thick. Put a 10-inch plate upside-down on the pastry and use a sharp knife to cut out a circle the size of the skillet’s top. 1. Cook the apples on the stove over medium high heat, 15­–25 minutes until the juice is bubbling and a deep golden or light brown color. 3. Remove the pan from the oven, lay the pastry circle over the apples, tucking it around the apples, and bake the tarte another 20 minutes at 400 degrees. Check the tarte after 15 minutes to make sure it doesn’t get too dark. The crust should be golden brown. If it still looks pale, return it to the oven, but watch it carefully because it turns brown quickly. Move the skillet to a rack and cool it at least 10 minutes and up to 30 minutes. Put a cutting board or flat platter over the skillet. Use potholders to hold the skillet tightly against the board or platter. Turn the skillet upside-down. Add any apples sticking to the skillet to the top of the tarte. ​If the tarte stands longer than 30 minutes after being baked, heat it over low heat for 1–2 minutes before turning the skillet over. Cut the tarte in wedges. Serve warm with vanilla ice cream or whipped cream, or just eat it plain. ​Kim Davis illustrates the steps in making a tarte Tatin on her blog Cinnamon and Sugar and a Little Bit of Murder. She has also shot a video of making the tarte Tatin. Beat the melted butter and eggs together. 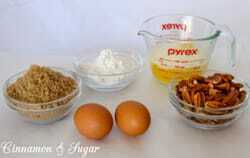 In a separate bowl, mix the sugar, flour, and pecans. Make a well in the center of the dry ingredients, pour the wet egg and butter mix into the well, and stir just enough to combine everything. Spoon the mixture into muffin cups. The cups should be 2/3 full. If you have some unused cups in your muffin pan, put a teaspoon of water in the empty cups. Baking can take anywhere from 15-25 minutes, depending on the size of the muffins. They’re done when a toothpick inserted into them comes out clean. Cool them on a wire rack for at least 10 minutes. Kim Davis illustrated the steps in making the muffins on her blog, Cinnamon and Sugar and a Little Bit of Murder. ​See her video of making the muffins on YouTube. ​This update corrects a discrepancy in the recipe at the end of Scam Chowder. One stick of butter equates to 1/4 pound. Cream the butter with the sugar. Stir in the nuts. Chill the dough in the refrigerator for 30 minutes, covered with plastic wrap. Shape tablespoons of dough into a 1-inch balls and place them on an ungreased cookie sheet, 2 inches apart. Bake 15-17 minutes, until cookies are set and just beginning to brown lightly. Cool on the baking sheet for 5 minutes. Transfer the cookies to a rack to cool further. If desired, sift confectioners sugar over the cookies. Alert readers noted that the recipe for strata in By Cook or by Crook left out the instruction about when to pour the egg mixture over the other ingredients. That instruction appears in bold in the recipe below. Brown and drain small chunks of the sausage. Beat the eggs with the milk (and salt if you use it). Cube the stale bread and spread it in a single layer at the bottom of a 9X13 inch pan. Sprinkle the sausage and the cheese on the cubed bread. Pour the egg mixture over the other ingredients. Refrigerate overnight or a minimum of an hour. This recipe is a nut-free version of the apple crisp recipe in By Cook or by Crook. Butter a shallow square baking pan (8 or 9 inches) or a small rectangular one (7x11 or 8x10). Combine the flour, cinnamon, and sugar. Add butter in pieces, mixing with a fork or the fingers until the mixture is crumbly. Spread the mixture over the apples. Bake uncovered for 45 minutes. Remove from the oven when the topping is golden brown and apple layer is bubbling. Cool the apple crisp for at least 30 minutes before eating. Serve warm or cold. The crisp goes well with vanilla ice cream or whipped cream. As the designated holiday dinner makers in our family for the last 25 years, we've experimented with different types of stuffing, starting from scratch or using various stuffing mixes. We've settled on a 5-ingredient one as the favorite, a modified version of the recipe on the Pepperidge Farm® Herb Seasoned Classic Stuffing package. Melt half the butter in a large skillet over medium heat. Sauté the onions for five minutes or until tender. Add the celery and cook for another 3 minutes. Melt the remaining butter in the skillet with the vegetables. Stir in the stuffing mix. Add hot water or broth slowly, mixing it with the stuffing until moist, using less liquid if you prefer stuffing on the dry side. Stove-top stuffing: Cover the skillet, remove it from the heat, and let it stand five minutes. Fluff the stuffing with a fork and serve. Casserole stuffing: Heat the oven to 350 degrees. Spoon the stuffing into a 2-quart casserole. Bake 30 minutes or until hot. For in-bird stuffing: Loosely spoon the mixture into the turkey or chicken cavity before putting the bird in the oven. Don't overfill the cavity. A stuffed bird takes longer to cook than an unstuffed one. Put any remaining stuffing in a casserole dish and bake it for 30 minutes at 350 degrees. 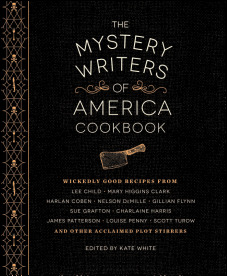 I'm thrilled that one of my recipes is in the Mystery Writers of America Cookbook. The book, edited by mystery author and former Cosmopolitan editor, Kate White, contains wickedly good recipes. The ones I've tried have been delicious. The recipe I contributed, Take Your Pick Vegetable Salad, feeds a crowd. Though it has more than five ingredients, it's a time saver because you assemble it the day before you serve it. With one less dish to prepare at the last minute for your party or holiday dinner, you have more time to spend with family and friends. Other mystery writers who contributed wickedly good recipes include Richard Castle, Lee Child, Nelson DeMille, Sue Grafton, Charlaine Harris, Louise Penny, Scott Turow, and possibly your favorite mystery or thriller writer. Buy from Kensington Books, Amazon, Barnes & Noble, Books-A-Million, Walmart, or a local bookstore. Find a nearby bookstore on Indie Bound. Order from Kensington Books, Amazon, Barnes & Noble, or find a nearby bookstore on Indie Bound. Buy from Amazon, Barnes & Noble, Books-A-Million, Kensington Books, or a local bookstore. Find a nearby bookstore on Indie Bound.